I have a thing with mascara.... yes, a thing. I don't know what that means either, but it accurately describes my relationship with the product so, chew on that for a little while. I am a mascara junkie (and a make-up junkie in general), meaning I buy things unnecessarily, just because I like the way it looks, and for the sake of trying something new. I think there are worse addictions, right? At this point in time I probably have upwards of 10 different mascaras in my make-up closet stash. The upside to this? I have a pretty good idea of products that work well for me, and can customize my look based on the way the product and I work together - it's like a team effort. I recently received Rimmel Scandaleyes Retro Glam Mascara through Influenster for testing and review purposes. I was like a kid in the candy store when I saw that I got a new mascara to try out. 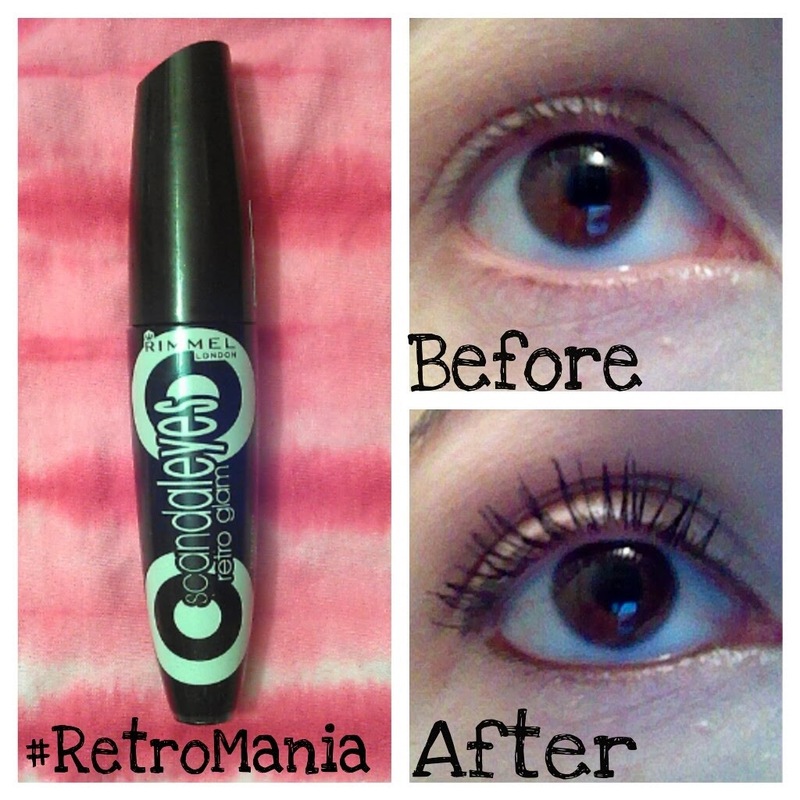 The kicker was, this mascara just hit the shelves in November 2013, so we had a bit of a head start in trying it! I can tell after trying a mascara ONCE whether or not we have "chemistry" and will be able to work together. I know it sounds ridiculous, but there are just some mascaras that make me sad in regard to their performance. Clearly, Rimmel Scandaleyes Retro Glam Mascara and I were a match made in Retromania heaven <3 In order to get these glamorously lengthened and defined lashes I first made sure my lashes were clean and dry, second, applied one coat to each set of lashes (moving slowly and carefully from root to tip), and third, applied a second coat while also using the wand to ensure my lashes were separated and evenly covered. Note: this mascara dries pretty quickly - to avoid clumping from over application, move quick enough to get it situated, but not too quick as to cause smudging/smearing or getting it all over your face. Simple enough for the most amateur of make-up appliers! Another mascara application tip: "swirl" the wand versus "pumping" it. Pumping can push air into the product making it dry out quicker and become prone to clumping and flaking. I love the thick, hourglass shape of the Retro Glam Mascara brush, the color of it (black without being harsh), and the effects it has on my lashes (I have very short lashes, and you can obviously see the results after using this mascara)! I definitely give this mascara a 10 out of 10 stars! Another feature of this mascara is that it is affordable! It retails for $5.99 and can be found anywhere they sell Rimmel London products (unless they are sold out - this is a HOT item!). Disclosure: I received the above mentioned product complimentary from Influenster for testing and review purposes. The opinions stated in this post are my own.